How do you make an on-screen romance between a man and a blow-up doll interesting? 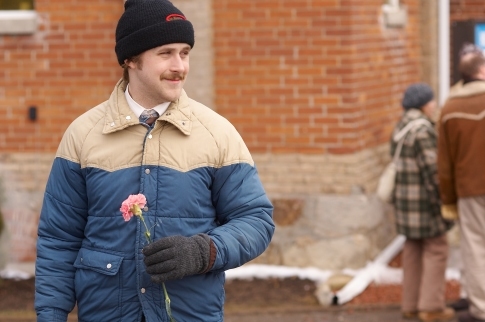 You do it with openness, faith, a touch of comedy and with Ryan Gosling playing the lead. There’s no easy way to explain the plot of Lars and the Real Girl, without sounding like a rambling idiot. I can’t imagine what it must have been like for the filmmakers when they had to explain to people what their movie was about. Although I applaud the originality, I can see why this film was a commercial failure. Films like this just don’t fare well with general audiences. But don’t let that put you off. It still has a place in cinema. Lars and the Real Girl shrieks with off-beat humour and indie quirkiness. It’s part comedy, part tragedy; a statement about the importance of communication to heal from grief. Gosling plays Lars Lindstrom, a painfully shy office drone, who spends his evenings sitting alone in his family’s cabin. His brother, Gus (Paul Schneider) and pregnant wife, Karin (Emily Mortimer) live in the house. Lars looks like the type of guy that might go on a murderous rampage at any minute. But no, he’s not psychotic, just extremely lonely. Karin is convinced there is something wrong with him. Gus, on the other hand, has resigned to the idea that his younger brother simply wants to be left alone. Just when you think Lars might actually be content with his isolation, he gets himself a new ‘girlfriend’. His new companion, named Bianca, is a human-sized doll he orders online. You really can find anything on the internet these days… Soon enough, he introduces her to Gus and Karin, and their reaction is priceless! They’re so shaken up they can barely comprehend the situation. It’s one of those movie moments where you have to ask yourself: what would I do in that scenario? There are some really funny scenes in this film, as well as some sad, moving ones too. Lars sees Bianca as a woman he met on the internet and he even makes up a whole backstory for her. He’s clearly delusional – but his fantasy helps him to break out of his shell and start opening up to people. It’s an intriguing idea that is well put together. Less convincing is how the whole town plays along with Lars’ delusion. It lessens the credibility of the film, as no one would ever run along with such a farce. Having said that, it is still hilarious, just because of that fact it would so obviously never happen in real-life. Strangely, you get sucked into Lars’ fantasy and you start accepting Bianca as a real person. As ridiculous as this sounds, we the audience actually start to like Bianca, just as many of the characters do. Despite the unrealistic story, the film works out to be deeply satisfying. In a nutshell, this film is about the acceptance of unusual people, the importance of friendship and how love can be infectious. It’s about who Lars is and how he chooses to deal with his problems. And that’s really all there is to it. Lars and the Real Girl is surprisingly effective with subtle purity. I’m a big fan of Gosling and he shines in the role. This film is a solid effort. Yes, implausible and unlikely, but if you go along with it, don’t take it too seriously, I guarantee you’ll enjoy this film. Have you seen Lars and the Real Girl? Does this sound like a film you’d watch? Let me know your thoughts in the comments! I watched this film in college and I found it interesting to say the very least. It definitely is. Pretty weird too. I’ve always wanted to see this movie and never have. I love mid-2000s Ryan Gosling with all the indies he did, and this was one that I missed. I read that he was nominated for a globe, and the screenplay was nominated for an Oscar! He’s been in a lot of good indies over the years and yeah he was nominated, he is very good in this film! I think I’d be willing to give it a try! Gosling is a solid actor and usually picks good projects. Lars and the Real Girl, wonder if it is as funny as the sketch in “Fools and Horses” where Del bought a consignment of rubber dolls, filled with a dangerous gas. Managed to dump them in a hole on a derelict site just before the dolls exploded! Ha I’ve never seen that one. Great review of a terrific and curious romantic tale. I love that Gosling went against his heartthrob “Notebook” persona to play a completely different type of romantic. To make this film work the filmmakers and actors deserve so much credit. You’re right, they do deserve a lot of credit. It’s such a strange but original idea.